One of the least Fanservice-y cat-fights I have ever seen... today. In epic Fantasy worlds, "subtlety" is forbidden from their tomes of legend. When there is a clear line between the forces of good and evil, conflict is inevitable. Conflict usually means combat and thus protection from the opponent is required. With protection comes the opportunity for Character Alignment-based fashion, because there is always time to look fabulous. Heroic armor is often done in primary or bright colors, either reflective chrome silver or the purest of gold, their monetary wealth a reflection of their moral wealth. If worn by the protagonist or the king, it will have a Badass Cape flowing behind them connected from the collar and embroidered by the symbol of the nation or their House. If enchanted, the armor is capable of surviving any blow no matter how improbable and enhancing the wearer's capabilities as a fighter, with an equally enchanted Anti-Armor weapon capable of rendering it useless. Evil armor is colored in dark, sinister colors, usually black and decorated in colors associated with villainy in context of the story like red or secondary colors. It can be reflective like it was carved from obsidian, or so rusted and aged that just putting it on could be a health hazard. They'll be covered in Spikes of Villainy because it is meant to elicit caution in all who see at, meant to look like it is as big of a danger to their opponents as their weapons. Typically worn by Tin Tyrants full-time or Evil Overlords during battle. Dialed Up to Eleven and that makes it Scary Impractical Armor. In rarer cases, the armor is cursed and it is what causes the bad behavior of the wearer. Of course these prerequisites are not exactly mandatory for the trope to apply. The hero can wear dark, battered armor and the rich villain could have saved a pretty penny for a shiny suit adorned with flowers and feathers. Inversions and subversions are as likely, just as long as symbolism can be drawn from the disparity. Often coupled with Good Weapon, Evil Weapon. Compare Character Model Karma Meter, for when you can tell where a videogame character sits on the Karma Meter from their appearance. Related to Armored Villains, Unarmored Heroes, Color-Coded Patrician, Elemental Armor, Good Colors, Evil Colors and Instant Armor. In the Happily Ever After arc of the main series, the nature of the Fables and their family curse causes Snow White and Rose Red to act out the Arthurian narrative. 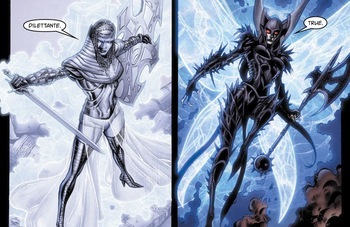 When it is made public knowledge that Bigby has been revived (albeit in a broken, feral state), they agree to work together to find him, only for Rose Red and Snow White to immaculately gain their own sets of armor, Rose Red's being shining and made of gold, while Snow White's black with a Skeleton Motif. Genre Savvy that they are, they realize that the narrative is actively trying to paint Snow White as the Bad Guy in the current narrative. While Snow White refuses to go along with it (turning her black sword white in the process), Red Rose slowly transitions into the role to the point of fanaticism, her sword and armor turning red after murdering Mrs. Sprat for the ring she used to control Bigby. Star Wars: In the original trilogy, the Stormtroopers wear completely identical, all-white armor with a skull-like helm. In the prequels, the Clone Troopers sport various predecessor forms of this armor which, while still mostly white, has friendlier-looking, colorful markings and they're allowed to customize it. Their helms also resemble more Mandalorian helmets (which were based on crusader helms) than skulls, though they are shown to gradually evolve into what Stormtroopers wear, just as the clones turn from heroic soldiers to the villain's enforcers. Most editions of Dungeons & Dragons have had magical suits of armor that were aligned with demons or celestials and followed this trope extremely straight. The Demon Plate armor is probably the most famous example, it's a suit of full plate that's covered with spikes and blades that you can attack your foes with, in addition to other enchantments that very with editions. Unfortunately, it's also cursed and drives you toward being Chaotic Evil (though since its appearance doesn't change when it isn't being worn, only a foolish or desperate Good character would voluntarily put it on) and also makes you very susceptible to the attacks and magic abilities of demons. Celestial armors, on the other hand, tend to do things like give the wearer angelic wings and healing or protective magic. The Chaos Armor in Warhammer and Warhammer 40,000 alike tends to be black, rusted with blood, and covered in spikes. The armor of Empire's knights and Imperium's Space Marines, meanwhile, is far sleeker and shinier, though they're not a whole lot more good. The Create-A-Soul feature in Soul Calibur III features a Karma Meter of sorts that determined your character's general attitude and outlook in combat based on what equipment you attached to them. Certain types of armor would move the meter between "Good" and "Evil". Equipping heavy armor covered in spikes would move you pretty far to the Evil side, where your character's dialogue would be aggressive and unrepentant. When Riku tries controlling the darkness (and in-turn allowing Ansem, Seeker of Darkness to possess him), he gains a suit that would later be labeled his "Dark Mode" form. In this form, his torso, arms, and legs are covered in black and purple material that resembles muscle tissue. On his chest is a symbol of the Heartless, except that the cross is not there, and he has a white cloth around his waist. In Kingdom Hearts: Birth by Sleep, this is retroactively verified as a type of suit that is worn by those who possess loyalties to Xehanort, Vanitas wearing a very similar outfit. In Kingdom Hearts: Birth by Sleep, it is revealed that Keyblade wielders are traditionally given access to what is called Keyblade Armor, a suit of Instant Armor that is shoulder mounted and can be used as both protection in battle and protection from the corrosive darkness that exists between worlds, acting as a type of protective space-suit. Aqua, Ventus, Terra and Eraqus all have their own sets of armor that reflects their own specific motifs are predominantly built for practicality. Master Xehanort on the other hand possesses armor that is meant to either emphasize his inflated sense of importance (his "No Heart" armor done in an elaborate monarch motif) or his affinity to the darkness (his armor after forging the x-blade emphasizing his Satanic Archetype role in the story). After Sora falls into darkness in Kingdom Hearts 3D: Dream Drop Distance, Riku is forced to fight a Nightmare that takes the form of Ventus' armor, imprisoning Sora within itself. Being a construct of darkness, it is completely black with the Nightmare Dream Eater symbol on its visor. In World of Warcraft, paladins wear shiny gold, blue, silver, and white armor to symbolize their connection the Light. However, when turned into death knights by the Scourge, they instead don black and grey armor littered with skulls and other malevolent ornaments. In Final Fantasy IV, Cecil is a dark knight whose armor is black, red, gold, and purple to represent his reliance on dark powers. After becoming a paladin, his armor is transformed, ditching the helmet and turning his armor a holy white and deep blue on top of giving him a flowing Badass Cape. Fable I: Most Player Character armor has "Light" and "Dark" variants that have the same defensive statistics but benefit or penalize the Karma Meter, respectively. NPCs tend to react happily or apprehensively to the PC's presence as a result. The Order of the Stick: The Sapphire Guard's enchanted armor only grants its benefits to a Paladin in good standing, effectively requiring its wearers to be Always Lawful Good. Downplayed in Trollhunters. The Amulet of Daylight and the armor and sword it produces in usually bathed in glowing blue and is made of a chrome silver daylight-based alloy. When Jim incorporates the Triumbric Stones (three stones that possess either a literal or archaic connection to the series' Big Bad Gunmar) into it, the armor and sword takes on darker tones - referred to as his Eclipse Armor - becoming black with red highlights. Aside from having a different summoning phrase and being able to remain active without the amulet being connected to him, it is functionally the same as his normal armor.